Notes: Raw = Effluent concentration of 396.5 mg/L BODu equivalent to raw (untreated) influent concentration; Less than secondary = Primary and advanced primary wastewater treatment; Greater than secondary = Advanced secondary and advanced wastewater treatment. 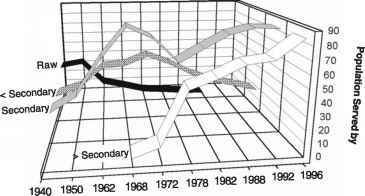 Effluent BOD loading by POTWs was significantly reduced between 1968 and 1996. In 1968, 4 years before the 1972 CWA, effluent CBOD5 and BODu loadings were 6,932 and 21,281 mt/day, respectively. By 1996, CBOD5 and BODu loadings were reduced to 3,812 and 16,325 mt/day, respectively. 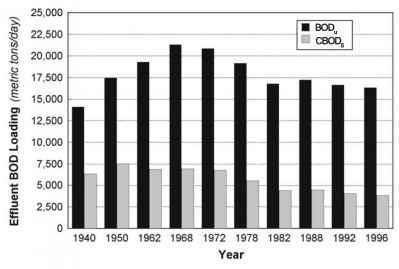 This represents a 45 percent decline in CBOD5 and a 23 percent decline in BODu between 1968 and 1996. Notably, these declines were achieved even though influent CBOD5 and BODu loading to POTWs each increased by 35 percent during the same time period! 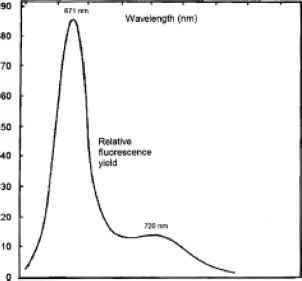 Figure 2-12 Total effluent BODu and CBOD5 loading, 1940 to 1996. Sources: U.S. Public Health Service Municipal Wastewater Inventories and USEPA Clean Water Needs Surveys. The proportion of effluent CBOD5 loading attributable to raw and less than secondary wastewater treatment was reduced from about 94 percent in 1940 to 35 percent in 1996 [see Figure 2-13(a)]. The proportion of effluent BODu loading attributable to raw and less than secondary wastewater treatment was reduced from about 84 percent in 1940 to 20 percent in 1996 [see Figure 2-13(b)]. 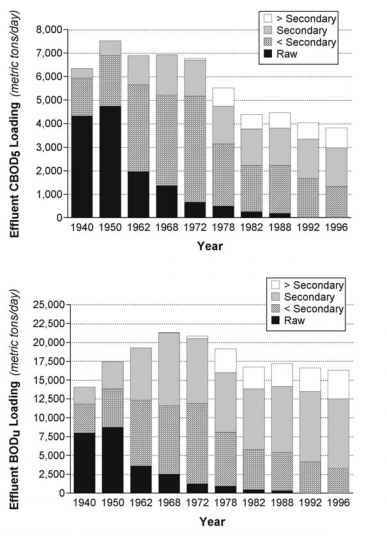 Figure 2-13 Effluent loading of (a) CBOD5 and (b) BODu from POTWs nationwide for select years between 1940 and 1996 organized by wastewater treatment type. Sources: U.S. Public Health Service Municipal Wastewater Inventories and USEPA Clean Water Needs Surveys. 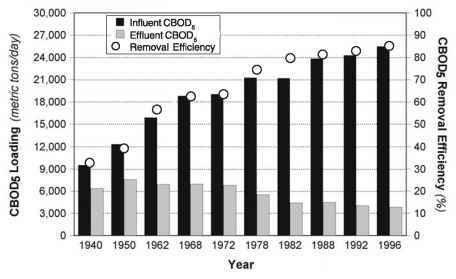 Figure 2-14 Total POTW influent and effluent CBOD5 loading and corresponding CBOD5 removal efficiency for select years between 1940 and 1996. Sources: U.S. Public Health Service Municipal Wastewater Inventories and USEPA Clean Water Needs Surveys. 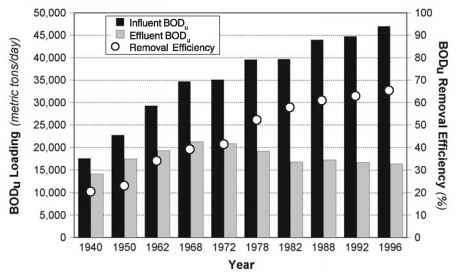 Figure 2-15 Total POTW influent and effluent BODu loading and corresponding BODu removal efficiency for select years between 1940 and 1996. Sources: U.S. Public Health Service Municipal Wastewater Inventories and USEPA Clean Water Needs Surveys. efficiency increased an additional 11 percent for CBOD5 and 13 percent for BODu. Those larger increases in BODu removal efficiency reflect the ever-increasing role of greater than secondary POTWs over this time period. Figure 2-16, a three-dimensional graph of the population data presented earlier in Table 2-5 and Figure 2-9, is useful for visualizing the trends in population served by POTW treatment type. The population served by secondary treatment facilities declined sharply between 1968 (85.6 million) and 1978 (56.3 million) and then leveled off at about 82 million in the 1990s. In contrast, the number of people served by greater than secondary treatment surged between 1968 and 1978 (0.3 to 49.1 million) and then increased steadily to about 82.9 million in 1996. Unlike secondary treatment, advanced wastewater treatment enhances biological processes to incorporate nitrification (ammonia removal) and denitrification (nitrate removal), thus reducing the NBOD fraction of effluent BODu loading. Figure 2-16 Population served by POTWs nationwide for select years between 1940 and 1996 organized by wastewater treatment type. Sources: U.S. Public Health Service Municipal Wastewater Inventories and USEPA Clean Water Needs Surveys. BOD loading reductions also continue into the future? A preliminary examination of estimated influent and effluent BOD loadings based on USEPA projections of POTW facility inventories and population served for the year 2016 indicates that the answer might be "no." • USEPA Clean Water Needs Survey (USEPA, 1997) estimates that 275 million people will be served by POTWs in the year 2016. This figure is based on middle-level population projections from the Census Bureau (USBC, 1996) and the assumption that 88 percent of the population will be served by POTWs in 2016. Assuming that 88 percent of the population projected for 2025 is also served by POTWs, about 295 million people will be served by POTWs. • Design-based BODu removal efficiency will increase from a nationwide average of 65 percent in 1996 to 71 percent by 2016 based on projections of population served by the different categories of POTWs. This removal efficiency is assumed to remain at that level through 2025. • Influent wastewater flow will remain a constant 165 gpcd and influent BODu concentration will remain a constant 396.5 mg/L for the projection period from 1996 to 2025.